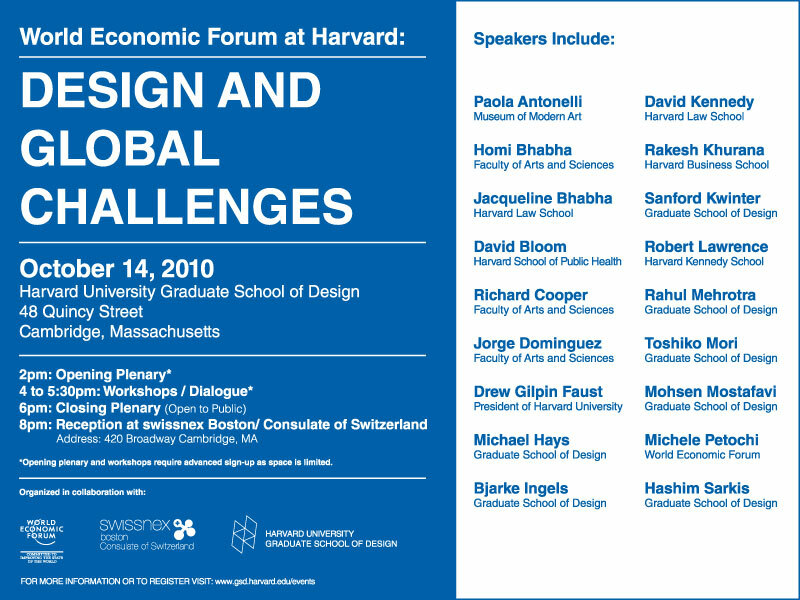 On Thursday October 14th the World Economic Forum will extend its format of global dialogue to Harvard University. Representing the first time that a structured, in-depth World Economic Forum dialogue will take place on campus, this joint program will be held on October 14, 2010, in Cambridge, Massachusetts. As its motto states, the Forum is “committed to improving the state of the world.” With this in mind, a series of working sessions at Harvard will gather feedback from the academic community, especially the students as the next generation who will live in the world shaped by the key issues that we will address in our discussions. Fostering a global dialogue in a place such as Harvard reflects the critical role that educational institutions play as the infrastructure of a knowledge-based economy. Universities represent intellectual continuity; they have a credible voice in society based on their independent research, and they nurture civilization via learning and teaching, cultivating the next generation of intellectually motivated citizens. They will play an increasingly important role in the future, one that is central to developing an ongoing global dialogue. The program will focus on proposals of the Forum’s Global Redesign Initiative, a project launched in the summer of 2009 with the question, “How can the architecture of global cooperation be redesigned not only to accommodate our deeper interdependence but also to capitalize on it?” Twelve hundred of the world’s thought leaders have been working in interdisciplinary multistakeholder groups (Global Agenda Councils) to identify gaps and deficiencies in international cooperation and to formulate specific proposals for improvement on more than fifty global challenges. Faculty from Harvard’s Faculty of Arts and Sciences, Kennedy School of Government, Law School, School of Public Health, Business School, and Graduate School of Design who are members of Global Agenda Councils will participate in the panel discussions and workshops. Design students and faculty, as hosts for the program, will be integrated into the discussions as agents of change. The aim of the conference is to develop a better understanding of the relationships that exist among key global issues and to surface points of connection through a dialogue that includes varied perspectives. Exposing students to diverse disciplines and ideas helps them to develop the ability to address global issues in a more informed, proactive, and comprehensive manner. Students and faculty from across the University are welcome to attend the program, which is articulated into an opening plenary, workshops/dialogue, and a closing plenary. Space is limited and advance registration required. The closing plenary, open to the public, will present the outcome of the afternoon’s sessions, featuring students and faculty from the six working groups. Participants from the Graduate School of Design will highlight the potential of the creative process to spark productive and imaginative exchanges. Through the deployment of design thinking and visualization, we will facilitate global dialogue as a generative discourse that can break out of silos of expertise. “The GSD proposes the discovery of intersections, interrelationships, interdependencies, and interfaces of issues. We will also ask participants to identify blind spots and look for early signs of future risks. We will look at global challenges from the point of view of models that describe scales, boundaries, space, territories, joints, surfaces, and depth. Use of spatial language superimposed on global issues will introduce dimensional vision, scalar relationships, and an understanding of sequence and time frame,” said Toshiko Mori, Robert P. Hubbard Professor in the Practice of Architecture, Harvard University Graduate School of Design, and organizer of the conference. The afternoon is planned as a rigorous but lively, engaging, and ultimately unforgettable experience. This conference is a pilot case for future Forum engagement with Harvard and other educational institutions, encouraging greater inclusion of voices from academia and younger generations. VisionArc will be attending the event and reporting on the conversations and outcomes in the following days. Check back in soon!